The Olympic gold medal [above middle] looks like real gold - but if you win it, don't try to sell it off, as it ain't gold. Although, as per the International Olympic Committee each gold medal must have a minimum silver content of 92.5% and at least six grams of gold. But at the London 2012 Games, copper has been used as the third ingredient. The Beijing Olympic medals in 2008 contained jade, which signifies virtue in Chinese culture. 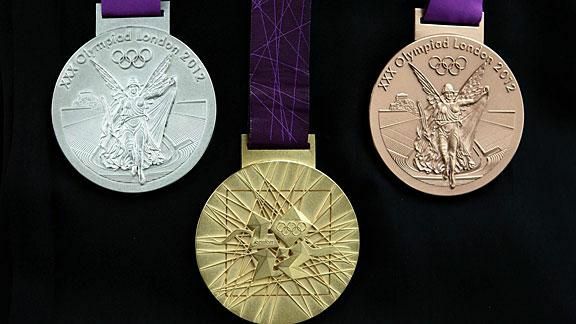 And as of now, the Olympic Gold Medal is 92.5% Silver, 6.16% Copper and only a paltry 1.34% Gold. Now yo can well imagine what is in the Silver medal! !